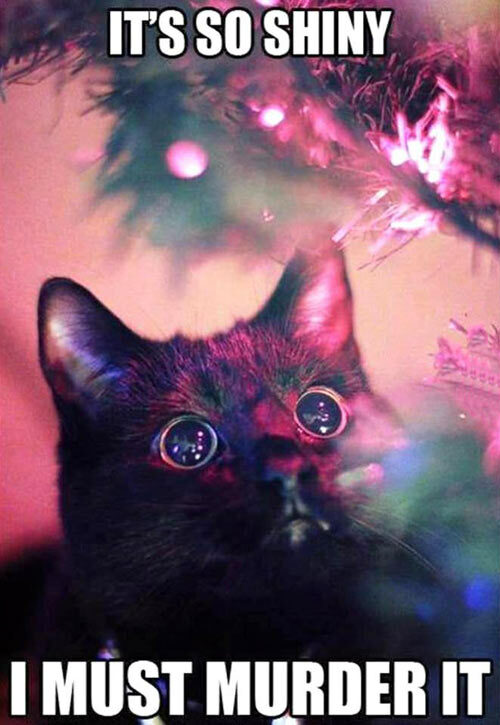 The joy of cats at Christmas time. We tossed our old artificial Christmas tree last year because it was looking pretty battle weary from years of being in the same house with cats. I had planned to buy a new one during the summer off-season, but it didn’t happen. Now it’s looking like we won’t have one this year at all which makes me sad, but not as sad as my cats who have noticed that the outdoor lights are up and glowing. That usually means the tree of shiny things that tinkle when you knock them down is usually not far behind. They are very confused by the lack of the tree of shiny things. This entry was posted in Humor and tagged Cats, Christmas, Humor by Les. Bookmark the permalink. Aw, no Christmas tree for the Kitties? Meanie! Trust me, it’s not by choice. Just don’t have the money to spend on a new one. Should be no problem getting a cheap tree on boxing day, the cats would enjoy it on New Year’s day just as much. But give ’em tuna and it’s all good.